Denis Kibukamusoke; Head of Consumer Banking at DFCU bank Uganda speaking at the launch of the revamped omni-channel ebanking platform at the DFCU Bank Uganda head offices in Nakasero on Wednesday 16th, May 2018. DFCU bank has on Wednesday launched a revamped eBanking platform for its Omni-Channels called Quick Banking to enable its customers make their transactions faster, safer, and simpler banking. The Omni-Channel consists of three channels to say; the use of USSD codes for feature phones, use of a mobile application for smartphones, and internet banking. 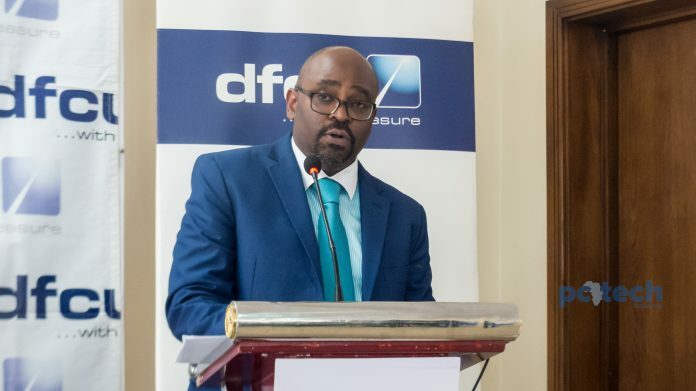 The announcement of the revamped was made by the Head of Consumer Banking at DFCU bank Uganda; Denis Kibukamusoke who reiterated the bank’s commitment to improving customer experience across all touch points. Denis pointed out that the revamped platform will provide a great user experience as well as ensure an enriched customer experience for their retail and corporate customers. “As technology continuously changes the way we live, banking is also changing. Our customers are more concerned about how they use their time and therefore how banking can be more convenient, fast, safe and simpler,” he said. Omni-Channel is providing multiple ways for customers to transact using USSD codes, mobile application, and via the internet with simply one password and username. With a one time OPT to verify that you’re the rightful owner of the account. A live demonstration of the new product was done in front of the press which promises customers a life uninterrupted by banking. Why Would You Want an Unlocked iPhone?